We’d love your help. Let us know what’s wrong with this preview of The Exotics Book 2 by De Kenyon. To ask other readers questions about The Exotics Book 2, please sign up. This is a book about what children do to other children when they sense weakness, vulnerability, and difference. in "Xanadu House" Rachael is again forcibly removed from her home and the remnants of her family, and thrown into the world of The Exotics. This time she goes not only as their champion, but as one of them. As she begins her bizarre transformation into a gecko Rachael demonstrates that familiar knack for accepting a weird truth, and using it to her advantage. In another writer's hands This is a book about what children do to other children when they sense weakness, vulnerability, and difference. in "Xanadu House" Rachael is again forcibly removed from her home and the remnants of her family, and thrown into the world of The Exotics. This time she goes not only as their champion, but as one of them. As she begins her bizarre transformation into a gecko Rachael demonstrates that familiar knack for accepting a weird truth, and using it to her advantage. In another writer's hands this could have ended up as an angst-ridden tale about the misery of being a supernatural creature, but De Kenyon makes it a rip-roaring tale about a little girl who will always fight for what's right. Children everywhere will be familiar with the type of school Rachael moves to. They will know bullies such as Toni and Sergie and they will have felt exasperation at teachers like Mrs Q, who never seem to see the bullies carrying out their mean tricks, but look up at exactly the right moment to see Rachael retaliate. They will also be familiar with Mickey, who knows the difference between right and wrong but is too weak to stand up to his friends. The fantastical events of the book are rooted in the very real everyday troubles and triumphs of ordinary children. Kids will empathise with Babra's attempts to escape the bullies, and absolutely love Rachael's disgusting plan to get back at them. Rachael is as strong in Book 2 as she was in Book 1: she has firm ideas about right and wrong and never lets the fact that she is up against stronger opponents deflect her from her determination to get justice for her friends. As an adult reader I found it extremely interesting that as the book progresses Rachael ends up taking on not only the children, but also their parents. The idea that the intolerance and cruelty of Toni and Sergie are rooted in the hate-filled philosophy of their parents is a brilliant piece of social commentary, and it is very telling that the most violent acts of aggression are perpetrated by the adults. As an adult, I'm not supposed to admit that I enjoyed reading a book for younger readers. But as a grandfather, it's okay for me to tell how much my grandkids will enjoy De Kenyon's book, Xanadu House. 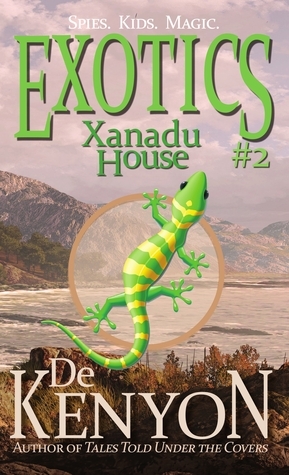 Xanadu House is Book 2 of The Exotics, and it's a bit hard to get started if you haven't read Book 1 (a problem which is readily solved). A bit hard, that is, if you're an adult with the adult kind of mind that insists on every question having a logical answer. On the other hand, Xanadu House has a As an adult, I'm not supposed to admit that I enjoyed reading a book for younger readers. But as a grandfather, it's okay for me to tell how much my grandkids will enjoy De Kenyon's book, Xanadu House. Xanadu House is Book 2 of The Exotics, and it's a bit hard to get started if you haven't read Book 1 (a problem which is readily solved). A bit hard, that is, if you're an adult with the adult kind of mind that insists on every question having a logical answer. On the other hand, Xanadu House has all the kinds of things kids love--as the cover promises, spies and magic. Plus likeable kids galore, and hateable ones, too. And mysterious characters doing incredible things. The Exotics are shape-shifters, each one having an animal side to call upon, sometimes intentionally and sometime by accident. Rachel's mom turns into a bee. Her friend, Babra, a cute cocker spaniel. Digger is a mole, and Rachel, our heroine, discovers her alter-ego is a gecko. Her gecko-form allows her to walk on ceilings and slip through small spaces so she can escape traps and also spy on plotting adults and kids. "Xanadu House" starts off with seemingly ordinary kid problems: staying with a relative, bullies at school, and homesickness. The story quickly becomes more complicated as Rachael gains control of her animal form and learns more about the bullies. The ending was my favorite part, even though it abruptly cut and left me saying, "That's it?!" out loud. The Exotics is a fun and exciting series, and even though it's technically for kids, I'm really enjoying it.